I've never used a K&N oil filter before.I've always used a Honda OEM filter.Well,I tried one this time when I did my oil change.Everything went fine,no leaks,nothing.I went for a short ride y-day,got to a stop sign,looked down & I've got smoke everywhere.Pulled over & there's oil everywhere coming from the oil filter.DAMN! I got the bike back to the house,put it up on stands,put a piece of cardboard under the bike & there's no oil leakage.Is there a chance I may have a faulty oil filter? Need some advice badly! I had this issue myself last year out of a K&N filter. I was able to get it to quit leaking after just tightening it down a bit more. Don't know if it'll work for you. And then you don't wanna overtighten it either. Had it happen a few years ago. I just tightened it about a quarter turn with a socket wrench to get me through a few days while I waited for Amazon to ship me another one. I didn't take any chances, just went ahead and changed the oil and filter. Over on VFRWorld is a thread where tons of people talk about their crappy K&N filter experiences. Do not use K&N oil filters. Damn for reals? What do you use on your RR? I've used a K&N twice on my '03 with no issues. Ended up using a Ryco this time, think its for a Mazda or something (checked and has same ID and OD and similar size). Worked a treat. Beats paying $29 for a K&N and $27 for OEM. Man I really like those VFRs..As for the filter, I've only ever had an issue out of one. Suzuki Forums - "What are the best sandals to wear on our bike?" Kawi Forums - "How long can you Wheelie?" 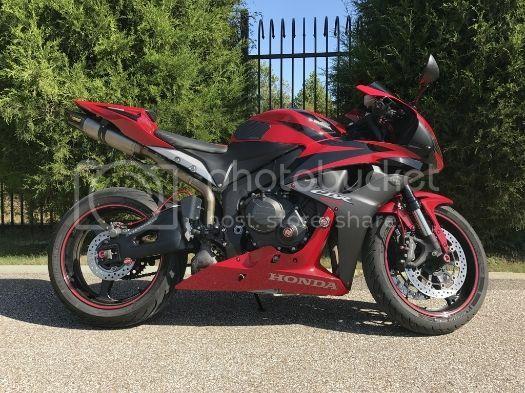 Honda Forums - "The physics of bike stands and their effect on contact patch stress over time given a varied degree of vertical angle." Damn that's rough. This was at a track? K&N is overpriced, i use Hi Flo Filtro HF204, never had a single problem with one. Had the same issues about a year ago. Tried 3 different K&N filters, repeatedly thinking that I may have just gotten a bad one...nope! Don't use K&N filters. Somewhere along the line, they turned to crap. Last edited by 6hunnit; 08-02-2016 at 03:59 PM. I would give the HF204 a go, however have to order them from US/Germany and pay $20 and wait a week or two, or I can duck down to my local car shop and pick up a Ryco Z436 for $15 any day. Cory Gillmore..well,I did tighten it down some more.Did a 1/4 in.turn like it says to do.Took it out for a test ride y-day & it seems fine now.I went to advance & got a Fram oil filter to keep w/me just in case. Fighting Chance..I did get the leak stopped.All I did was turn it a 1/4 in. with a 17mm & it seemed to work.I took it out for a test ride y-day & it seems fine.Do you think it will be ok until my next oil change? I went to Advance Auto & got a Fram oil filter to keep w/me just in case.Thanks for the holla back. It'll probably be fine, what I would do, is before I ride, I'd reach down through the fairings to try to run a finger along the lip to see if any fresh oil has accumulated, and around the nut on the end as well. I use the hiflo as well. No problems ever. K&N about 2 years ago moved their production facility to china and ever since then i have heard of many more problems. I believe K&n is also the reason that most USA racing orgs have mandated that oem be the only filter used. Too many problems with K&N FAILING ON PEOPLES BIKES. Not sure if this applies to motorcycle applications, but K&N changed their manufacturer for their oil filters recently. It went from Made in USA, to Made in Mexico, to Made in Korea. The quality of the filters decreased substantially when going from USA to Mexico. I'm not sure how it changed going to Korea. I had no issues using K&N filters for heavy track duty when they were made in USA, but moved onto Mobil1 once they changed. It's not worth the risk, plus they're ridiculously overpriced. Last edited by kneepuck_envy; 08-02-2016 at 06:41 PM. Also worth mentioning that a lot of guys have done independent tests splitting various filters apart and Fram invariably places last every time. I'd stay away from Fram as well. Athough ironically I've used Fram for many years in the past with no issues and my brother swears by them and hasn't had any issues either. Risk vs reward I guess. I'm more of a Purolator, Mobil1, or Wix guy when accessible.